Pomegranates are pretty in a number of ways. First of all – pretty hard to decide if they are a shrub or a tree! They are either a short shrub-like tree, or maybe a tall tree-like shrub. Mature plants have multiple trunks and reach 6 to 12 feet high and generally 6 to 12 feet wide. This size makes them good for a smaller yard, and their multiple trunks make them a good screening plant. 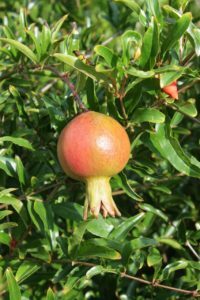 Pomegranates can be trained into a tree-like form but tend to sucker readily. This indicates that genetically, pomegranates think they are a shrub. Indeed, many desert native “trees” around the world have a shrub-like habit which helps them shade their trunks and feeder roots around the dripline. Pomegranate plants are pretty in the traditional sense. 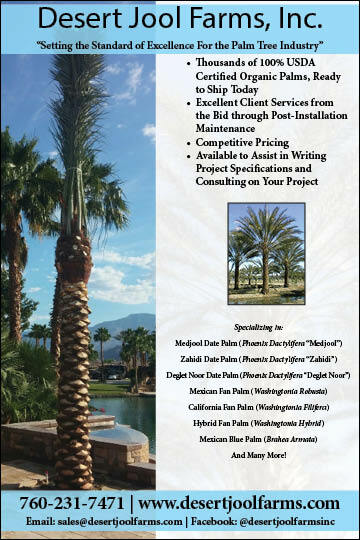 They offer year round interest in the landscape. Rich, bright green leaves in summer turn golden yellow in autumn and drop, leaving the smooth cinnamon and gray bark in visible in winter. In spring, the leaves grow once again emerging at first with an almost bronze hue. Spring also brings several weeks of radiant flowers. Bloom color depends on variety, from lacy pink and white to salmon, to red, or scarlet. These bright blooms are pollinated by our calm native bees as well as European honeybees. Soon the fruits start to develop, and take long slow months ripen. Pomegranate fruits come in a variety of colors when ripe, from a yellowish green with red freckles, to pink, to crimson, to an almost black hue. The fruit that is lighter colored when ripe are less bothered by birds than those that turn red. The interior of the fruit varies in color as well. The ‘Kino Heritage White’ is popular because it does not stain fingers. Pomegranates are self-fruitful, so a single tree is all that is needed for fruit production. Some pomegranate varieties can have thorny stems, so select plants carefully. Pretty easy to grow, pomegranates grow well in our alkaline soils, not needing extensive soil amendments and constant monitoring like citrus trees. One exception is clay soils, they do require well-drained soils. Pomegranates grow in full sun, but appreciate some afternoon shade in our Southwest summers. Partial shade is also fine for the plants but reduces flowering and fruit production. Reflected light is not ideal. Blazing hot Southwestern summers are not an issue for pomegranates, nor are cold winters. Found in the snowy Judean mountains of Israel, they tolerate winter lows to 10 degrees F. While the trees are fairly drought tolerant, they get water once a week when they have leaves, they will fruit better. Fertilizer is not necessary, but can help increase fruit production. That said, fruit drop is aggravated by too much fertilizer and excess water – making this a good tree for the the homeowner who is not a gardener. Meanwhile this plant is also good for the avid gardener that might want an espalier. They do well against a wall, or even woven through a chain link fence. 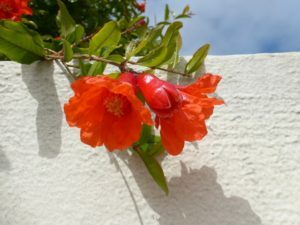 The dwarf pomegranate (Punica granatum ‘Nana’) is very dwarf – attaining only about 3 feet high and wide at best. This makes it a good plant for container growing, looking quite charming in a bright pot on a patio. It shares the container well with some daffodil bulbs for spring interest. Pomegranates can be used for the homeowner who wants an edible landscape, or possibly for a Biblical theme garden. The landscape around an older home should sport a pomegranate or two, just as they did in the years of the first European settlers in the Southwest. Dr. Jacqueline Soule has been writing about gardening in our region for over three decades. Her latest book Month by Month Guide to Gardening in Arizona, Nevada and New Mexico (Cool Springs Press) just arrived in December. It’s a good companion volume to Southwest Fruit & Vegetable Gardening (Cool Springs Press, 2014).